When people are asked about their concepts for their future wedding photos many think about going to the beach or some exotic location. Some people would think about sitting happily at the place where they have first met or dated. Others think about something really kooky and hilarious to avoid the cliches of wedding photos. 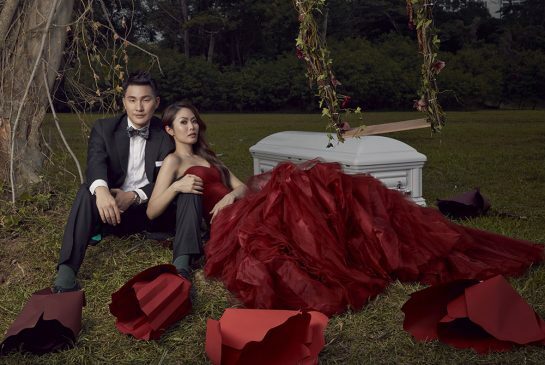 But for Jenny Tay and Darren Cheng their idea of the perfect wedding photo is having a coffin as one of their props. Sure, it does sounds a bit morbid or cringeworthy while others may think that the couple is doing a playful take on “till death do us apart”. But according to the couple they just wanted to share how much they are passionate about their trade. Both Tay and Cheng work for Direct Funeral Services. Tay is the Managing Director and Cheng is the company’s operations and business development director. It was Tay who wanted to incorporate a symbol for their jobs in their wedding photos. As a couple mentioned that it is their mission to modernize the trade and help remove the taboos surrounding it. The couple asked for the help of photographer Joel Lim. Lim, who is an expert at photographing fashion and commercial projects, was glad to be the photographer for the shoot. The response to the couple’s photos are overwhelmingly positive. The couple mentioned that many of their friends think that their wedding photographs were done in a very tasteful manner. The couple hopes that their wedding photographs would help in encouraging conversations about death and loss, and help overcome the taboo that surrounding it. What do you folks think? Are Jenny Tay and Darren Cheng’s wedding photographs great? Do you think it was done in a very tasteful way or not? We’d like to hear your thoughts below!